I am being a bit lazy and re-blogging my post of 31 October 2013. It is a sentiment that I still share. Happy Samhain to all my readers! I hope that, no matter how you celebrate the day, you do so safely and with great enjoyment. Amongst modern neo-pagans and magical types, Samhain is one of the two great gates of the year, the other being the festival of Beltane in May. As you may know, in the Celtic lands in more ancient times, this is the time when livestock were slaughtered to provide meat for the coming winter and and when preparations for the cold season were in full swing. With the nights lengthening toward the Winter Solstice, shadows growing longer earlier and earlier each day and the energies of the earth sinking into dormancy, it was only natural that humans might also seek to turn within as well. As with Beltane, Samhain was seen as a time when the veil between the worlds was thin and one might more easily commune with the beings of the Otherside. Amongst the Celts, at least, this communion seems to have taken the form of honoring the Ancestors and keeping up good relations with the Faerie. It was well understood that spirits of all kinds walked the night during this season and one had to be particularly careful if one had to be out and about but this was also a time when, for example, an extra place might be set at the table for visiting relatives who were no longer in their bodies. As well, gifts of food and drink were left in a prominent place out doors for the Fair Ones as they made their rounds on Samhain. While offerings could be left for the Fair Folk at any time and, indeed, they often were, it was absolutely necessary to leave something (and do so generously) at Samhain to avoid any hostility on the part of “them ones”. There is more than enough information on this feast out on the Net. Wiccans, in particular, love this time of year with all its witchy associations so feel free to check out some of their sites and have some fun, even if you are not of a neo-pagan bent. Even if you are not inclined to believe in the Faery or other spirits that wander the night, each of us has Ancestors and, as I mentioned previously, Samhain was a time of honoring those ancestors and communing with them. In this day and age when we avoid death, hide our dying in hospitals and nursing homes and bury or cremate the dead as swiftly as can be arranged, we sometimes forget that, if it were not for the Ancestors, we would not be here. As many magical workers will tell you, we literally stand on the shoulders of those who have gone before and it is up to us to prepare the way for those who have yet to come. I urge you, on this night when the veil is thinnest to do some honor for your Ancestors. It may be something as simple as lighting a candle for them and saying a small prayer, setting a place for them at your dinner table or putting out a good cigar for your Uncle Vinny who loved a good smoke. Or you may decide to do something as deep as going to visit the ancestors in meditation. I am going to provide a link at the end of the blog to a resource that can help with this if you have never tried anything of this nature before. Andrieh Vitimus is a well known magician and priest in the Haitian Vodou tradition who knows a great deal about contacting the ancestors. I wish you blessings on this most holy night. May you walk in peace as the dark half of the year begins and as your energies turn within may you find new aspects of your self to bring forward when the sun returns to the earth. Recently, one of my readers asked if I had heard of Tracy Twyman or the book she has been touting on podcasts, Clock Shavings. Honestly, I had not and I replied thusly but agreed to investigate a little. What I found, in the course of looking at Ms. Twyman’s blog and listening to one of her interviews, left me quite unsettled. She stated at one point that she was “so busy talking to demons” that she did not have time for contact with other entities (even though she claims to have talked to Jesus once). In addition, Ms. Twyman stated that she sometimes got contradictory information from the spirits that she communicated with. In addition to all this, my general impression of the entities that she was communicating with is that they presented themselves as sort of super-villains intent on toying with mankind. Now, I have never used a ouija board and have no intention of ever doing so but I do know a thing or two about spirit communication, having some mediumistic tendencies, and evocation and this interview was, in my mind, a primer on how not to communicate with spirits. 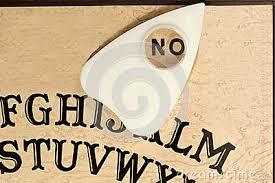 One of my main concerns with the ouija board is not that people are talking to spirits. If you want to see if you can raise your dead grandfather or talk to a faery being that is your business. My concern is all those people out there who basically get onto the board, put out a call to anything in the vicinity and then wonder why they get chilling messages or even spirit interference in their lives. 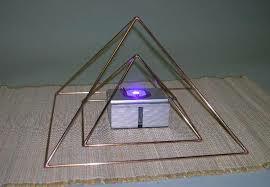 It is the equivalent of setting off up a beacon in the Otherworld and talking to whoever happens by. As I have noted repeatedly in this blog, most of the residents beyond the veil could care less about humans but those who are attracted to our energy can be quite beneficial, neutral, mischievous or downright malevolent. If we look at this from the point of view of a medium, someone who is alleged to have concourse with spirits on a regular basis, basic training for this talent involves a stepped series of meditations that seek to introduce the medium to what some might call their gatekeeper. 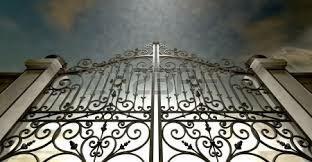 The gatekeeper is a spirit who, after long acquaintance and repeated testing, is entrusted with vetting the contacts that come to the medium and/or providing the medium with information about approaching spirits and warding off those that are not helpful. In Harner style neo-shamanic training, one does not approach or deal with other spirits until one has developed a relationship with a power animal (Lower World) and a guiding being (Upper World) and one never travels shamanically without the accompaniment of an ally. The purpose, again, is to provide the shamanic practitioner with a vetting system for spirits and to get the practitioner to the spirits that he or she is seeking or may need for assistance. Finally, a magician who is seeking to evoke a spirit works hard to make certain they get exactly the spirit that they are evoking. He or she will study the known characteristics of the spirit, try to find a sigil or other symbol that calls forth the presence of that spirit, make note of the sort of offering the spirit might accept and so forth. Once all the research is done, the magical worker puts together a ritual that puts out a call for that spirit, and that spirit alone unless he or she is seeking to summon forth more than one being – a tricksy proposition at most times. The point of this rambling? In none of these traditions of spirit communication is it acceptable to simply throw the doors open and admit whoever or whatever shows up. Even in the possessory religions, since as Vodoun, where the spirits actually ‘ride’ their followers, there is a progressive induction of trance that is set in a strong cultural base that summons those spirits (the lwa) and those spirits alone and there are set methods for bringing the person out of trance if needed. The point is that the spirits do not control a spirit communication; the medium, shaman, magician etc is expected to know what they are about, to test any spirits they encounter and to be able to banish anything that does not belong. That seems a far cry from picking up the planchette and going to town, does it not? Why is this important? Because, my good readers, like people, spirits lie. While there are many beneficial and powerful beings in the Otherworld, who are quite interested in assisting and informing humans, there are also any number of beings that hold humans in disdain or worse. Not all of these beings will resort to outright attack. Many of them will preen in the glow of the attention they are getting and will tell the person communicating with them anything to keep that person coming back. Spirits have access to knowledge that we do not and they can be quite good at pulling things out of a person’s consciousness stream, adding some information or pseudo-information and giving the person exactly what they want to hear in words that sound oh so reasonable and make the human feel just a little bit superior. I am sure Ms. Twyman would disagree with me, vociferously, and that is her right. I am sure that she has had communications but I reserve the right to question the true nature of the spirits with which she has had concourse. Can We Prove There Is An Afterlife? My birthday passed recently. When I was younger, this occasion usually involved over-eating and, when I was much younger, over-indulgence in alcohol. I have mellowed considerably through the years and, rather the ‘celebrating’, I take my birthday off from work and spend some time doing things I enjoy (such as writing for this blog and catching up on paranormal media). I also spend some time reflecting and, as I get older, I confess that my thoughts sometimes veer toward what happens to us when we die. Now, please don’t think that I sit around having morbid thoughts for my birthday. In my own belief system, death is not something to fear; it is simply a birth into another type of life. Neither I nor anyone can say with certainty what that life looks like but my experiences tell me that there is more to come after death. Unfortunately, many of the skepdebunkers and members of the scientific community seem determined to paint those who believe in an afterlife as non-critical, non-scientific thinkers, at best, and raving loons, at worst. According to their viewpoint, human beings are their physical bodies and consciousness is simply an accidental byproduct of brain function. When the organism shuts down, we simply cease to exist and that is the end of it. Belief in an afterlife is the result of wooly headed silliness that we learned from religion and ought to be firmly set aside so that we can face the reality of our existence – that we have a certain span of time on this globe and then we are through. The part of the human being that will survive is whatever work they leave behind at death. Obviously, I disagree with this assessment and my disagreement exists on a number of levels ranging from the materialist theory of consciousness to their complete and utter refusal to even consider the possibility of an afterlife. I’ve just finished reading Greg Taylor’s excellent book Stop Worrying! There Probably Is An Afterlife and I believe that Mr. Taylor makes a very good case for belief in something following death. It is not my intentions to review the book; Mr. Taylor was obviously heavily influenced by Chris Carter’s work, Science and the Afterlife, but presents the arguments in a way that most laypeople can follow. While I admire Mr. Carter’s work, it is quite heavy reading that needs to be taken in doses. Mr. Taylor shapes his argument around a number of different phenomenon including the so called Near Death Experiences, deathbed visions, reports of caregivers to the dying who have witnessed any number of paranormal events (lights appearing around the dying person etc), appearances of the recently deceased to their kin and friends, the extensive investigation of mediums by the Society for Psychical Research in the late 1880’s and into the 1900’s. If I do not have my books confused, I believe that Mr. Taylor also mentions the research of Dr. Ian Stevenson who has recorded and investigated many cases of apparent reincarnation. If you are interested in any, or all, of these phenomenon then please read the book. Mr. Taylor has an engaging style that only occasionally gets bogged down (as when he gets into the discussion of quantum physics). The book contains good introductions to these topics and the notes section is extensive and will provide further reading on topics of interest. then I believe that most rational people would at least be moved to continue investigation into these matters and, remember, that I have just touched the tip of the iceberg of data Mr. Taylor includes in his book. I think the greater question might be why these matters are not taken more seriously in the scientific community. I can not, for the life of me, explain why anyone would be so dead set in their materialist and, often, atheist view of the world that they were completely dismissive of this evidence. Granted, many of these reports are anecdotal but, if biologists had not listened to anecdotal reports of the natives of Africa about a man-like being that lived in jungles, the gorilla would have remained a cryptid for much longer than it did. In my modest opinion, scientists are not taking these reports and the in-depth research of their predecessors seriously because to do so would shake their world view – their beliefs – and cause them to have to re-think the way they view the universe. Oddly, it may well be the scientists who need a healthy dose of reality.